What a fiery discovery! The Makansutra forum was thrilled to see Chef Tang De Hai (previously at Bai Yu Ren Jia which had closed) resurface at Chengdu Restaurant. A few quick emails later, 20 of us gathered for an impromptu dinner there to re-live his authentic spicy dishes. Just look at the signature 水煮鱼 Fish Filets in Hot Chili Oil (S$18.80 small; S$36.80 large), which arrived in a huge rectangular ceramic container that looked like a kitchen sink. So much chili and fish swimming together! Even as I write this, my mouth is watering and stomach shrivelling at the memory of the volcanic heat. 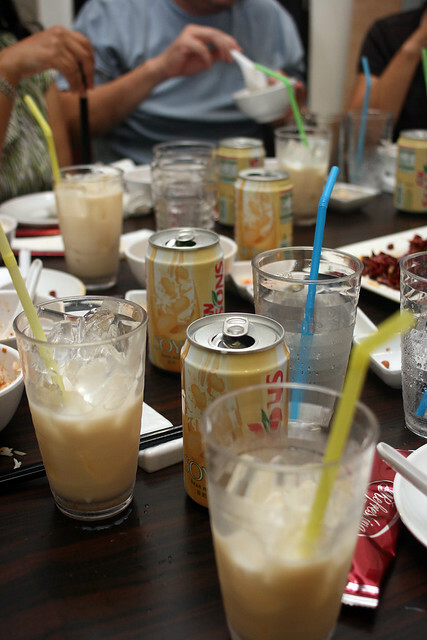 Well, that wasn't what we started with - it would have numbed our tastebuds too much. 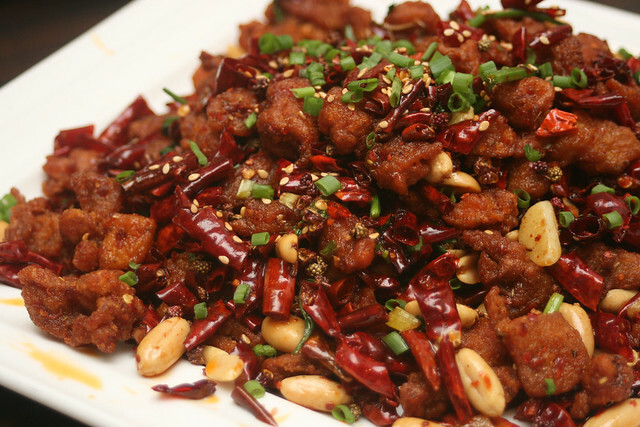 We began with some cold dishes and (relatively) less spicy dishes. 重庆口水鸡 Marinated Chicken in Sichuan Style (S$9.80). 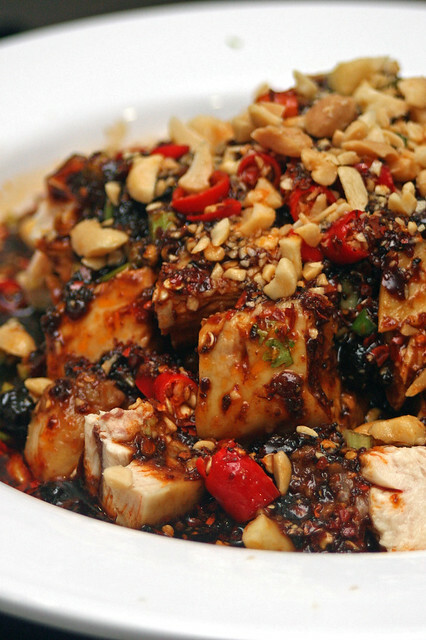 Cold poached chicken doused with spicy sauce and peanuts. This was good, but the chicken pieces were diced too small. We ended up gnawing on chunks of bone on some pieces. We gave the chef feedback so we hope he will change the way he cuts these in future. A very awesome 蒜泥白肉 Pork with Garlic Sauce (S$7.80). The pork slices apparently are slightly dried and cured for more crunch and texture. This ranks as only "one chili" on the menu's spicy meter (maximum three chilies), but still has significant kick. Fried Bitter Gourd with Minced Pork (S$8.80 small; S$16.80 large) had me reaching again and again for it. I don't usually like bitter gourd but I was polishing this off. It's fried with some "mei cai" (preserved mustard greens), "hae bi" (dried shrimp) and maybe "chye poh" (preserved radish), so it's super umami! 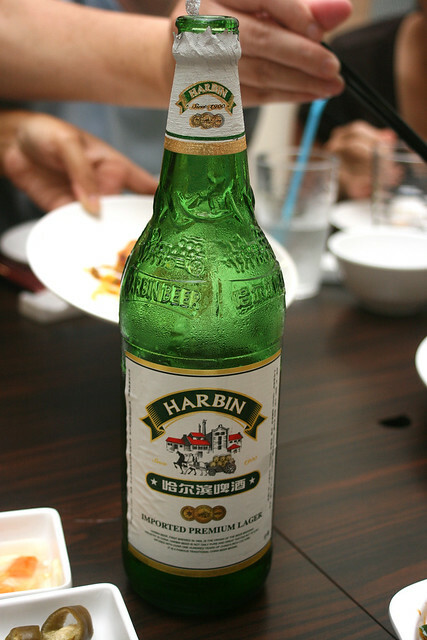 Harbin lager! I did not try this, but it looked interesting. Never seen this before. 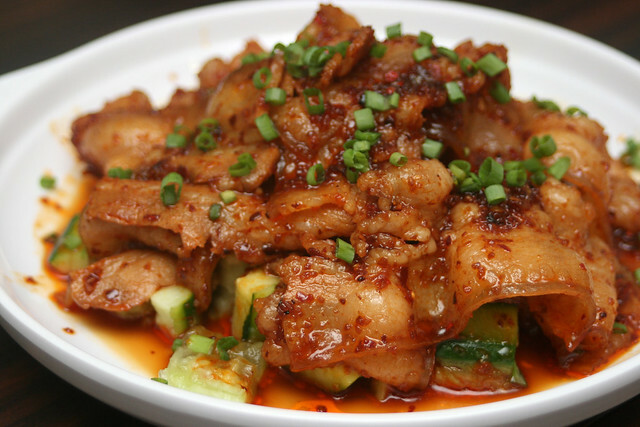 四川回锅肉 Sliced Pork in Spicy Sauce (S$12.80 small; S$24.80 large). Another excellent dish that went down well with everyone. 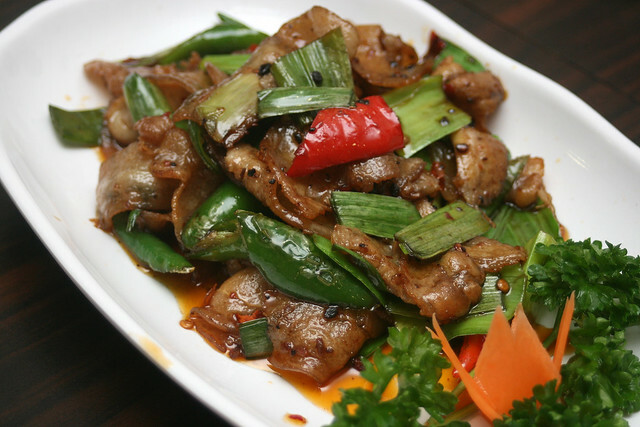 The green capsicum had caramelized so beautifully, making it a sweet complement to the pork. Close up of the 水煮鱼 Fish Filets in Hot Chili Oil, which is the dish that came next. The fish is actually not the spiciest part. It's the thick tanghoon (mung bean vermicelli) that's soaked up most of the fiery goodness. Can you see it hidden under the beancurd sheets and beansprouts? Slurp that up! And just when we think we've tried the hottest dish, along comes my favourite of the evening. 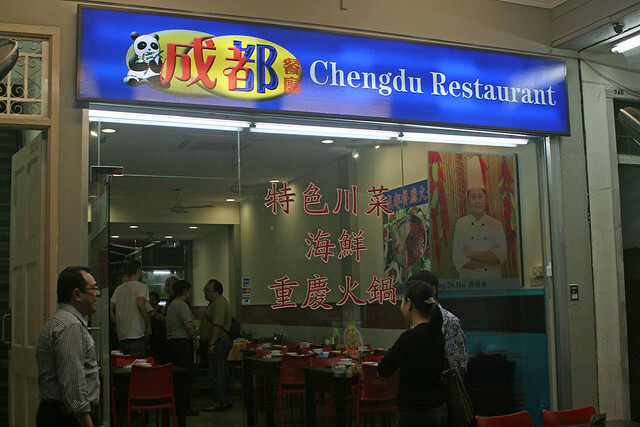 The 重庆辣子鸡 Chong Qing Deep-fried Chicken (S$16.80 small; S$32.80 large) is even more spicy than the fish! But you just can't stop popping the crispy crunchy fragrant fried chicken pieces - they're almost like crispy pork lard. The heat doesn't hit you until maybe 2-3 seconds after chewing. Absolute heaven...followed by hell. And then you do it again. Along the way we doused the fires with soya bean milk. These are our little fire engines. And off we went to torture our tongues again. 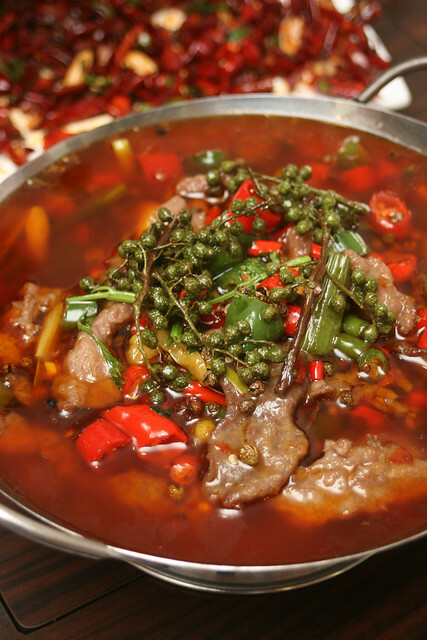 哑巴牛肉 "Mute" Beef (S$19.80) - so hot it will mute you! Actually, what really makes this sting is the high temperature of the dish. It simply amplifies the chili heat many more levels. Once it's cooled down, the beef is actually much easier to eat. You'll still be able to talk then. If you don't eat beef, they do this dish with chicken, fish, and frog legs too. 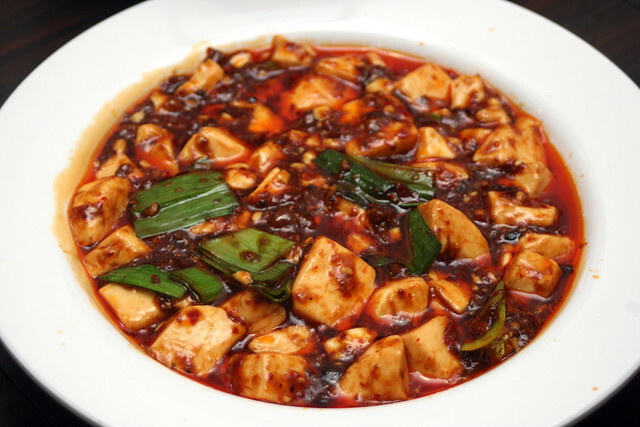 麻婆豆腐 Beancurd in Spicy Minced Meat Sauce (S$8.80 small; S$16.80 large). Ah, this was very comforting after rounds and rounds of spicy assault. Great with rice. 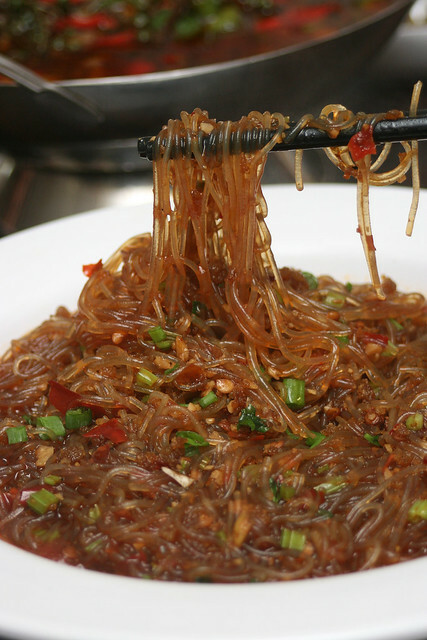 蚂蚁上树 "Ants Climbing the Tree" - Stir-fried Mung Bean Vermicelli with Spicy Minced Pork. 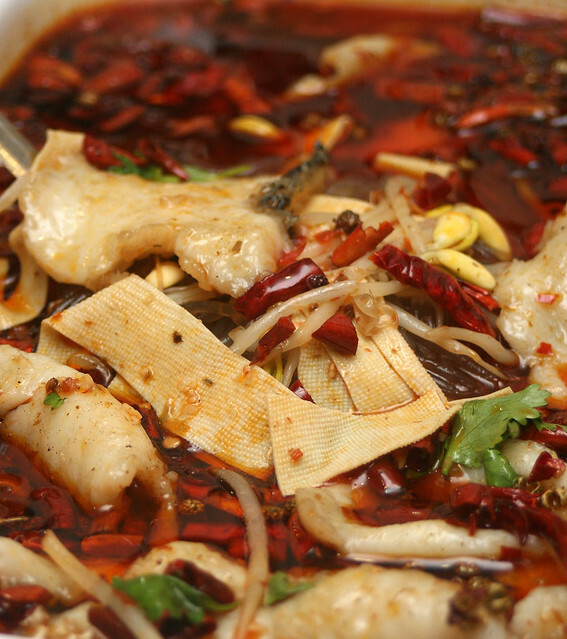 It's a popular Sichuan dish. By this time, we were so accustomed to chili, we had no trouble with this. 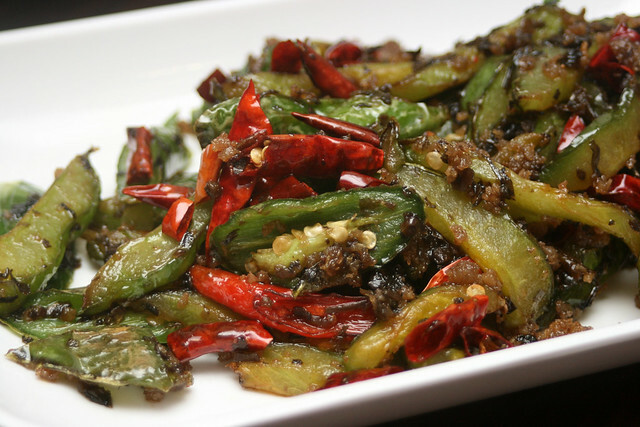 It's not all spicy torture at Chengdu Restaurant. 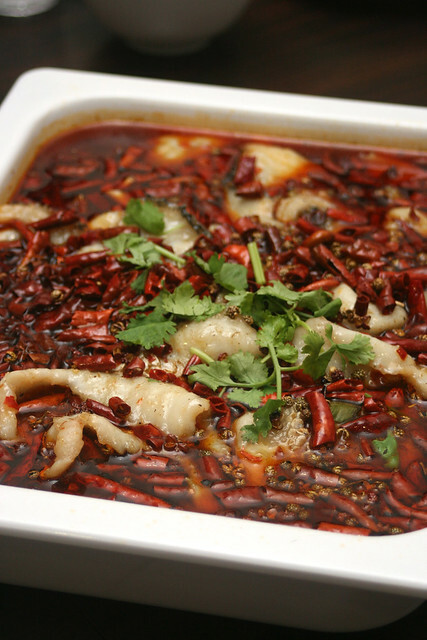 They do have totally non-spicy dishes, such as pig stomach and chicken herbal soup, deep-fried duck with yam, regular stir-fried vegetables with garlic/oyster sauce, french beans with minced pork, soup dumplings and gyozas. But we all just seemed to zero in on the hot and spicy. There are several Sichuan restaurants here. Look for the one with the panda logo. So sad I couldn't join you guys for this outing! It looks soo good! What a great post to a great meal! Having been one of the lucky souls to enjoy that same meal that night, I agree that our beloved chef from Ba Yu Ren Jia is BACK! And I will be, too, at Chengdu, over and over! Thanks for the tip, Min! Yeah warm soy will probably dislodge the spicy stuff better off our tongues. Superfinefeline: I'm sure we'll be there again. You still in the US? Kevin: Yes, I'll be back there too! :) Great to see you too. Catch up again another time. Lovely writing; I have enjoyed reading very much. And, thank you for the link!